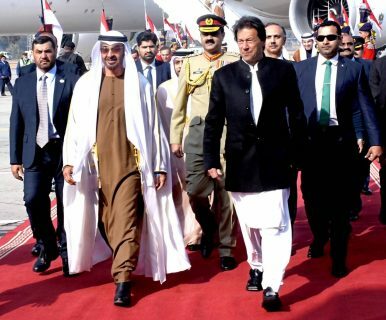 Abu Dhabi’s Crown Prince Sheikh Mohammed bin Zayed bin Sultan Al-Nahyan last week briefly visited Pakistan and secured Islamabad around $3 billion in financial support. Reportedly, the United Arab Emirates has also agreed to offer another $3 billion in oil subsidies to assist Pakistan with its ongoing balance of payments crisis. If materialized, the financial support being offering by the UAE is going to be significant for Pakistan as the latter scrambles to shore up its depleting foreign currency reserves. However, the recent flurry of diplomatic activity between Pakistan and the UAE need to be put in the context of other developments taking place in the region. Riyadh and the Gulf Arab states always expect Pakistan’s cooperation when it comes to their security needs in the Middle Eastern region or elsewhere. Pakistan, for decades, has shown that the country is willing to support the Arab monarchies if it gains economically in return. However, this policy on Pakistan’s part has had serious implications for the country. Over the past three decades, Pakistan has gone through one of the deadliest sectarian conflicts mainly due to its foreign and security policies, which pitted the country’s Sunni and Shia population against each other. This has largely been done, on the one hand, to pacify Riyadh’s desire to promote Sunni Islam on Iran’s borders, and on the other hand, to attract more capital from the Kingdom. Saudi Arabia’s financial assistance and large aid packages encouraged Sunni groups into sectarian politics to appease their funders. Sunni groups not only targeted the Shia population, but also Iranian military personnel and diplomats as well. In retaliation, Shia groups also formed militant wings, which openly called for Iran’s support. The sectarian dimension of Islamabad’s cooperation with Saudi Arabia and the Gulf Arab states has always worried Pakistan’s policymakers. Pakistan, which has regained relative domestic peace after not only reining in domestic sectarian groups, but also changing its policy of supporting Riyadh’s security interests, doesn’t want to continue the usual financial assistance for a security trade-off relationship with the kingdom. However, the country’s worsening economic situation has been hurting Pakistan lately. While the Gulf Arab states and Riyadh have made large financial commitments to Pakistan recently, it’s uncertain what Pakistan has agreed to offer in return. While Islamabad openly states that “no troops are being sent to Yemen,” the only utility Pakistan may have for the Kingdom and its allies remains in its military significance. Certainly, Riyadh and its allies will want assurances from Pakistan in terms of its military support, which remains paramount for the former’s ongoing armed adventures. While Islamabad may continue to insist that no troops are being sent to Yemen or elsewhere, the sudden revitalization of bilateral relations could not have happened without Pakistan’s support for Riyadh or its allies’ Middle Eastern policy. Perhaps the understanding at this point is to keep Pakistan’s military cooperation as a low-key engagement. It’s only a matter of time before Islamabad’s engagements become a piece of public knowledge. Islamabad’s military engagement on behalf of Riyadh, which Tehran may perceive as in conflict with its interests in the region, is going to drive a deep wedge between Pakistan and Iran. Any such development is not going to remain confined to the Middle East region only. Already, in an interesting development, Iran has admitted to having influence over the Afghan Taliban, which the former is willing to use on India’s behalf. India, which for now supports the Afghan government, may also be looking to prepare for all possibilities that are likely to emerge after the proposed U.S. withdrawal from Afghanistan. This is something that is not likely to go unnoticed in Pakistan as the country remains committed to limiting India’s influence in Afghanistan. While Islamabad may not like to admit it, the money that is being pumped into Pakistan by Riyadh and its allies in the Gulf region is not likely to have come without conditions. For now, Pakistan may use the money to address its economic woes, but Islamabad’s support for Riyadh and the Gulf Arab states, if not balanced smartly with Iran, may have higher costs for the country.